As a social marketer, you may encounter situations where you need to post publicly and others where content needs to remain private. 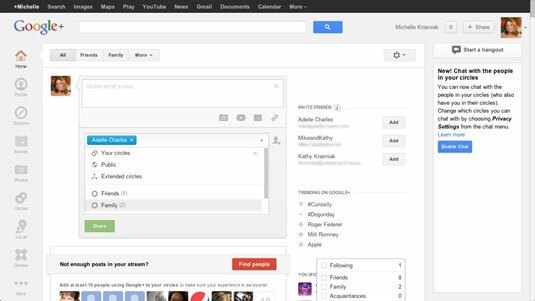 Google+ is easy and intuitive to update with new content. If you spend time on other social networks, this is the same idea; post your content into the designated box on your screen called a Share box. You can share with specific Circles, to the public, or privately to one or more individuals at a time. 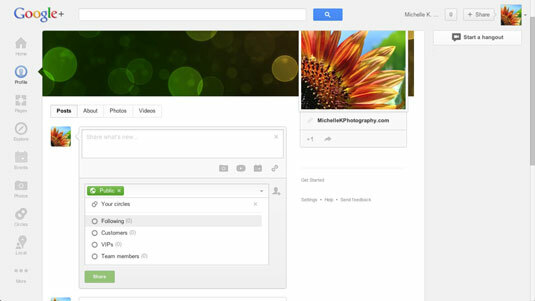 There’s no mistaking your Share box; it appears on the top of the page, as soon as you access your Google+ account. To post updates to specific Circles, click in the Share What’s New box, which opens a drop-down list. From the drop-down list, select only the Circles you want to share with. To send a private message, choose only the person or people you want to send the message to by using their names with a + symbol in front of them, in the same way you do with tagging. Tagging specifically calls out a person or brand; the message appears in their steam and in their notifications.